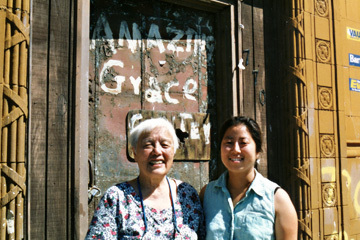 Filmmaker Grace Lee, right, interviewed Grace Lee the activist in Detroit. "The Grace Lee Project" seems like the perfect vanity vehicle for a filmmaker. What could be more fun than traveling the globe in search of others who share your name? Lee was even in Hawaii in the fall of 2002 to track down four Grace Lees she had discovered through acquaintances and her Web site, GraceLee.Net. Luckily, beyond Lee's self-deprecation and sense of humor, she has some real chops, having co-produced and directed "Camp Arirang," a documentary about prostitution in South Korea, and short fiction films that have made the festival circuit. Most recently, "The Grace Lee Project" earned her the Emerging Director Award at the Asian American International Film Festival in New York. Beyond the question of what's in a name, Lee manages to raise some serious issues about the danger of stereotypes. Lee's tale begins with her childhood in Columbia, Mo., where her identity was built on being unique, the only Asian girl for miles. That changed when she moved to the West Coast and not only saw other Asians, but heard of many who shared her name. Invariably, the other Grace Lees were described as being "nice," "quietly intense," "smart," "the essence of purity." She was left aghast by the profile that emerged -- of an interchangeable, pious, piano-playing, college-educated drone with combination skin -- and says in the documentary, "I realized with horror that maybe that's how people see me. What happened to Grace Lee? Why did no one keep in touch with her? How can she be so impressive and so forgettable at the same time?" Many of the Graces were given their name by parents who were Christians or fans of America's blond "princess" Grace Kelly. With the name came high expectations that many of the Graces lived up to, causing the filmmaker additional stress. "Hearing of all the Grace Lees made me wonder what went wrong with me," she wondered. "How did I wind up with the name that essentially makes me the one loser in a sorority of super-Asians?" Hawaii's dental hygienist Grace Lee and former KGMB reporter Grace Lee both have screen time. The latter is profiled in depth, revealing that the two Asian girls she knew while growing up in Alabama were Jennifer Kim and Grace Lee. The filmmaker was happy to find one incidence of rebellion in a Grace Lee who set fire to her school, an act admired by her peers due to its unexpected nature. But the filmmaker is disappointed when the "bad" Grace Lee turns out to have had a good reason for her act of arson. In her quest to find someone who could break the mold of Grace Lees as perfect little peacekeepers, Lee traveled to Seoul to meet the founder of the city's first lesbian bar. But in the time it took to complete the documentary, that Grace Lee no longer wanted to be part of the project, out of fear of embarrassing her family. Lee's quest turns out to be one of concern to any Asian woman who wishes to shatter the perception of being passive and weak, and poses the universal question "How does anyone transcend a label?" in a nonthreatening way.